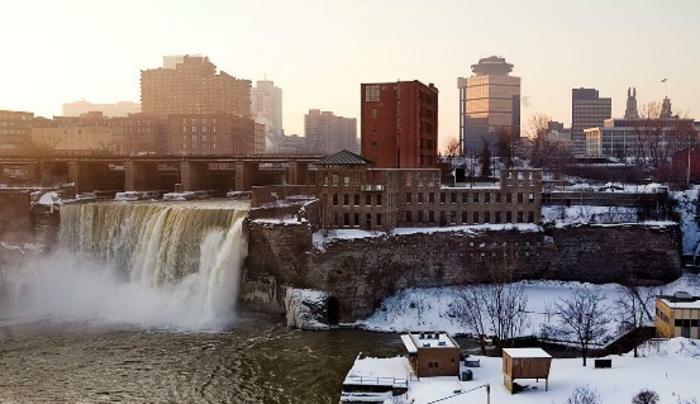 Located in the heart of the historic Brown’s Race neighborhood, the High Falls Interpretive Center and Museum offers something for everyone. Whether you’re visiting Rochester for the first time or are a long-time resident of the “Flower City,” the interactive Museum and Welcome Center provides an inviting place to learn something new about local history. The beautifully refurbished 19th-century Waterworks Building that houses the Center is a living museum in its own right. Within its walls, you can watch the past unfold before your eyes. Visitors begin their journey in pre-historic Rochester at the base of a simulated glacier and complete their tour by returning to the 21st century. In between, they discover how the city was settled and the ways in which people employed water power to transform the region into an industrial boomtown.